As I described in a previous post, my return to work co-incided with a sudden lack of time to actually play games, plus a Steam sale that magically sucked money out of my wallet. With a fresh badge of Steam games acquired, I decided I would use my time to actually finish games in my library that I had started before. The first game that I completed then was Bastion. This means that it definitely wasn’t Liore who finished this game last, hah. 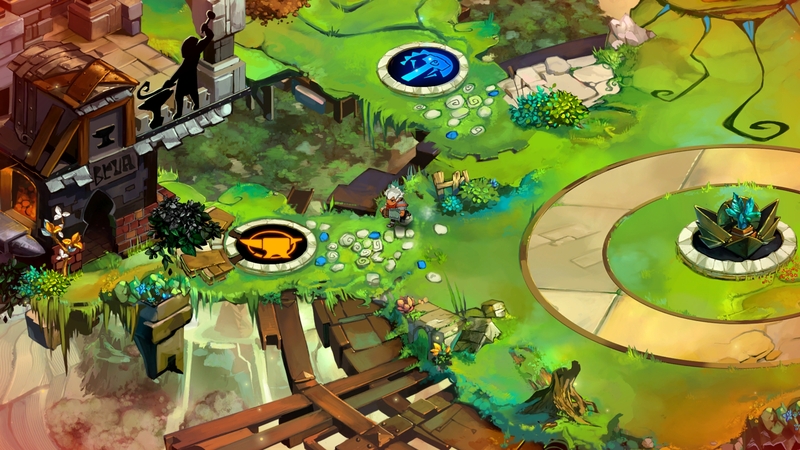 Bastion is the first game by the indie developers Supergiant Games. They have since released a second game, Transistor, which was one of my summer purchases. But back to Bastion. It’s a colorful action-adventure. I first started playing this months ago, and to put it kindly, I pretty much sucked at it. I have since acquired an XBox controller for my PC and find that many games that were released on multiple platforms are actually way more enjoyable when you use a controller instead. Bastion is one of those games. In Bastion, your character never has a name, though the narrator refers to him as The Kid. He wakes up in the City of Caelondia which has fallen into ruin after an event called the Calamity. As you move about, the ground forms under your feet, isometric-style, and your story gets told by the only other survivor you meet, Rucks, an old man. Once The Kid makes it to the Bastion, a place of safety, Rucks sends him to other parts of the ravaged world, to collect Cores to power the Bastion. While in the beginning, you know absolutely nothing about what happened to the world, the story-telling is done completely by the narrator, who reveals more and more of the truth of what really happened. By the time the end of the game came about, I was deeply moved by the story. There’s a seriously haunting moment in the game when The Kid has to make a decision, and this moment combined with a really fantastic soundtrack really made the game for me. The narrator does not only provide more and more background info, but also directly comments on what’s going on, for example if you happen to fall off the platforms (like I managed multiple times) or if you chuff one health tonic after the other. As for the gameplay, you play various highly colorful levels with isometric view and fight your way through them until you have found the core or later in game the shard. A variety of different monster types are in your way, from small scumbags, to bigger creatures, and you have to adjust your battle strategies accordingly. You have to choose a main weapon and a special attack at a blacksmith, e.g. at the Bastion before you go to another area, but sometimes you find new weapons in levels and can swap to them on the go. Weapons include a hammer, a very fast sword, various kinds of guns, etc. It’s always a strategic decision and I switched it up a lot. Each level you complete allows you to use the core to build something in the Bastion that allows you to improve the various weapon, or if you like challenging modes to make the game harder for higher experience rewards. The Kid levels up and gets more powerful, though it’s not a huge part of the game. I think I was level 5 by the time I completed the story. Interspersed are areas where you can practice the different weapons and the better you do, the better the reward you get for defeating the practice challenge. I never got more than silver for the challenges, because I am not that awesome. The art-style is very steampunk meets Firefly, with a wild west vibe in the way The Kid dresses, and the soundtrack strongly suggests this as well. As mentioned above, the art is very colorful and never dull. Levels are vastly different. From bogs and marshes where you can never see what might be lurking in the tall grasses, to the crumbling city of Caelondia, to sky ships carrying you through the air while air defenses shoot at you from every angle. It’s quite diverse, and I thought it was beautiful. Combat with these fellas requires a lot of dodging their painful hammer blows. 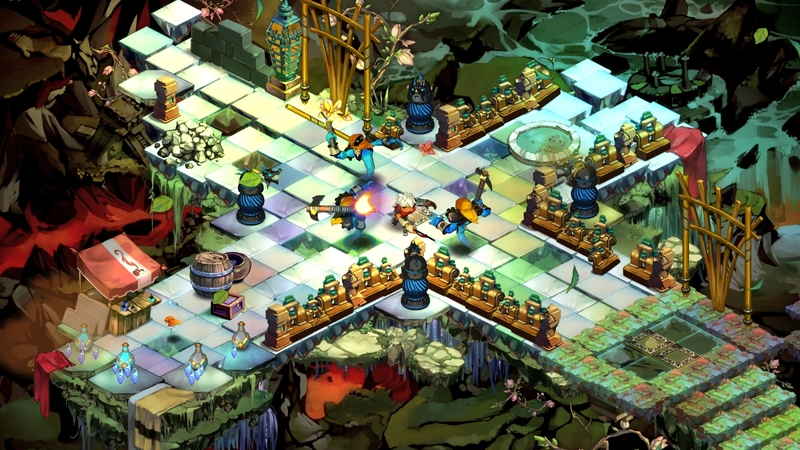 Bastion is a short game, clocking at 9 hours for me for my playthrough. There’s a New Game+ that gives you access to all weapons and abilities right at the start, but I wasn’t tempted to play that. If you enjoy action-adventures, it’s a fun one to play for sure. The unusual story-telling through the narrator might not be to everyone’s liking and probably makes or breaks the enjoyment of the game. Or maybe that was just me. In any case, if you do enjoy action-adventures, I highly recommend picking it up. It’s usually one of the items that gets a heavy discount during the Steam sales. It’s amazing how much a narrator can add to a game. I thought the narrator in both Bastion and Transistor wass a lot of what made the games so good (though I did prefer Bastion). Similarly, the narrator in The Stanley Parable really opened up new opportunities for storytelling within a game that I really enjoyed. I could handle having more games where nice voices talked to me throughout. I started playing Transistor shortly after Bastion and have to admit I found it jarring that Logan Cunningham is now the narrator again. It almost feels one-trick pony-ish, if that makes any sense. I will go back to it soon, maybe I can enjoy it more when the Bastion memory isn’t quite so fresh. The glimpses of the Transistor story were quite fascinating so far. The soundtrack is on continual rotation on my playlists, it works very well for background music while working. As you mention I liked that the level progression was paced, at no point did I feel overpowered and always treated mobs with caution. Very nice to still have that feeling even towards the end of a title.